TSA Groping Bill in the Hands of the House - This bill must pass! Yesterday, in a move of uncharacteristic dexterity, the Texas Senate passed the TSA Anti-Groping Bill. The bill now is in the hands of our Texas House where I am confident it will be dispatched to the Governor for signing and a future court battle over Texans' right to travel without being molested and unreasonably searched. 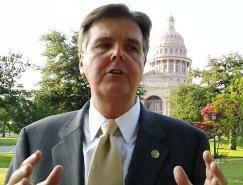 Texas Senator Dan Patrick (R-Houston) told me this morning, "Last night the Texas spoke. Let's hope Washington listens. It was apparent that since the House could not pass the TSA bill for final passage until late Tuesday, and the session ending Wednesday, we had to take quick action in the Senate. Tonight, with a series of procedural maneuvers, and convincing a few members who opposed the bill to suspend the rules to bring it up, I was able to pass SB 29, the TSA bill. This is the best version of the bill offered to date. District attorneys, the Attorney General's office, citizens, and fellow Senators contributed to the final version of the bill," added Patrick. "The bill is now in the hands of the House. They have 2 full days to pass in committee and on the floor. The Texas Senate has refused to knuckle under the threats of the federal government, I hope the House passes our bill before the deadline," stated Patrick. Lt. Governor David Dewhurst also released a statement last night that TexasGOPVote published. Yesterday, while meeting in Austin with Lt. Gov. Dewhurts's staff, Sen. Patrick's staff, and State Reps Allen Fletcher, David Simpson, and Calendar's Committee Chairman Todd Hunter, I learned a lot about this legislative process and the hard work that is being done by our elected officials to make this bill/battle become a reality. I also had the opportunity to witness an act of bravery that many might say is not found often in politicians. That act being State Rep. Debbie Riddle (R-Spring) standing up to a very angry crowd led by Alex Jones where she stood her ground and explained the process of getting this bill passed. I have video of this event and will post that soon. Republican Congressional Candidate Dianne Costa had this to say about this issue that is of importance to many Texans, "Like some things in our Government, they may start out with good intentions but left unchecked, these good intentions may become intrusive. A good example would be TSA. Certainly no one would argue that we want safety checks in place at our airports, particularly after the events of 911." Costa continued, "Yet many times we react in extremes and become so hyperfocused in one area that we become neglectful in others. We are now subjected to personal searches by TSA, who is authorized by the Federal Government, that in some cases go beyond pat downs. These searches now include the innocent of our population." "In contrast, the borders, ports of entry, access points to the US and it's sovereign territories in some areas of our country are unprotected allowing those who pose a genuine threat to our country unabated access. What is wrong with this picture and other decisions such as healthcare, energy and the recent arms fiasco in Mexico knowingly made by our Federal Government," Costa concluded. I believe this bill will pass and Texas will once again, draw a line in the sand. 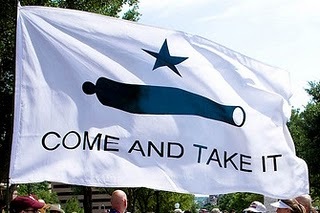 We will tell the Federal Government, COME AND TAKE IT!